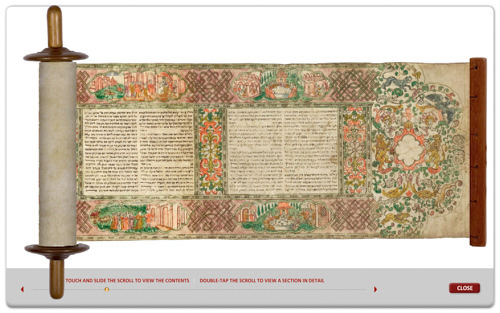 This fine Venetian scroll is an example of an Italian megillah with an engraved and hand-colored border. It can be dated circa 1675, based on inscriptions found on two identically engraved scrolls, one dated 1673 and the other 1680. Four animals are placed around the perimeter of the initial floral border: a leopard, an eagle, a deer, and a lion. These animals are a reference to the passage from the Mishnah that counsels Jews to be “bold as a leopard, light as an eagle, swift as a deer, and strong as a lion to do the will of God” (Pirkei Avot 5:23). Although there does not appear to be a direct connection between this teaching and the story of Purim, the artist may have chosen to include these iconic animals as a visual reminder that one must perform the commandment of reading the megillah with alacrity. The foliate designs at the beginning and end of the scroll include an oval that was provided for the addition of a family emblem, which has been left blank in this example. It is an early example of megillot that share similar engraved borders printed in Italy between the late seventeenth and early eighteenth centuries. In addition to illustrating Esther scrolls by hand, artists sometimes designed decorative engraved borders to be printed on parchment; many were subsequently hand-colored. Scribes then copied the text of the book of Esther within the printed borders, producing a scroll fit for ritual use. This technique increased the availability of beautiful megillot by reducing cost and shortening the time needed for production. The practice of creating engraved borders for scrolls began in Rome in the late sixteenth century. Despite the technical difficulty and expense associated with printing on parchment, in the seventeenth century the tradition spread to Amsterdam and Venice, two of the most important centers of Hebrew printing in Europe. 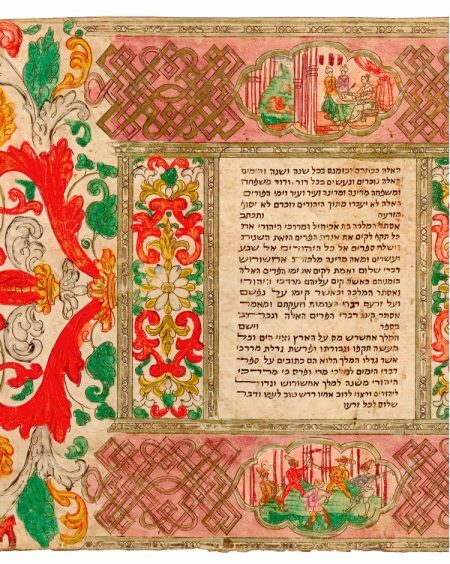 In these two cities during the eighteenth century there was a sizable surge in the production of Esther scrolls with engraved, hand-colored borders. Bodea 2002; Frojmovic 1997; Metzger 1966.